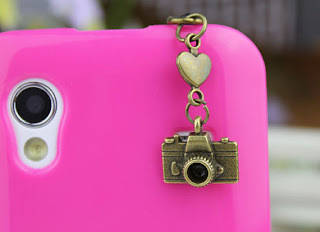 I was looking for small gift ideas for a friend who always update herself with the latest gadgets and techie items when I saw this cute retro bronze camera dust-proof plug for mobile phones. Since it has a unique design and something that don't have too many colors I think this would be nice for her. It will definitely fit her iPhone 4s. Trinkets for cellphones are included in my product listing! Creating them is so much fun! And seeing friends love them and use them make me happy!